I motored until the moon was directly overhead; then I shut everything down. We’ve burned enough fuel for this early in a long passage, I thought, just over a quarter of our 200 gallons. There was no wind. I went to bed. Dawn was squally. Decks were wet; the sky, gray and misty. 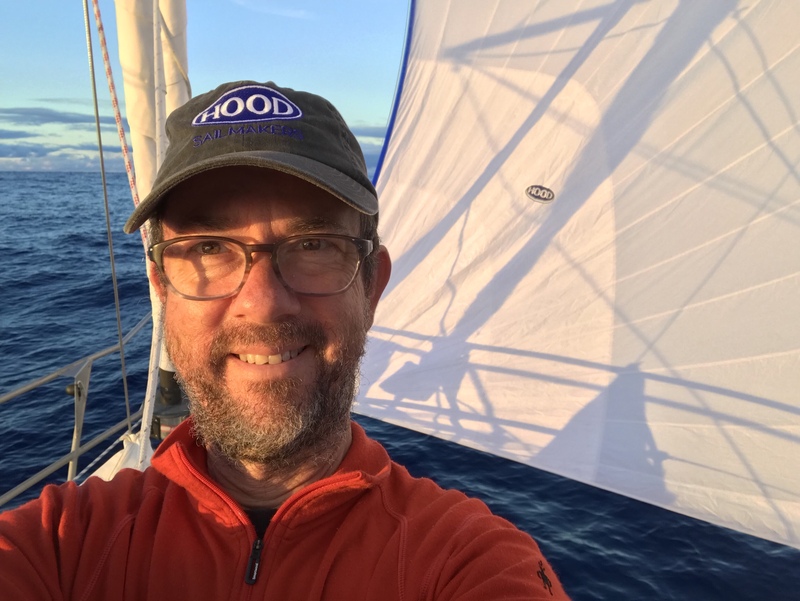 I set the big genoa with which we just made steerage. Then things went still. Wind: 3 knots. That much doesn’t even register on my newly shaved cheeks. Even the petrels went down on the water. Randall: I must be paying for past sins. This has to be the longest bout of calm I’ve ever experienced. Monte: Not sins, Senior. Just one. Randall: And that would be? Monte: Flirting with a monster. Randall: Come clean, Monte. What are you about? Monte: Senior, you don’t go this close to a high without expecting to get stepped on. Then I found in our inventory a spinnaker. Brand new. Made by HOOD. Now who would have ordered such a thing? I lofted it just after lunch. 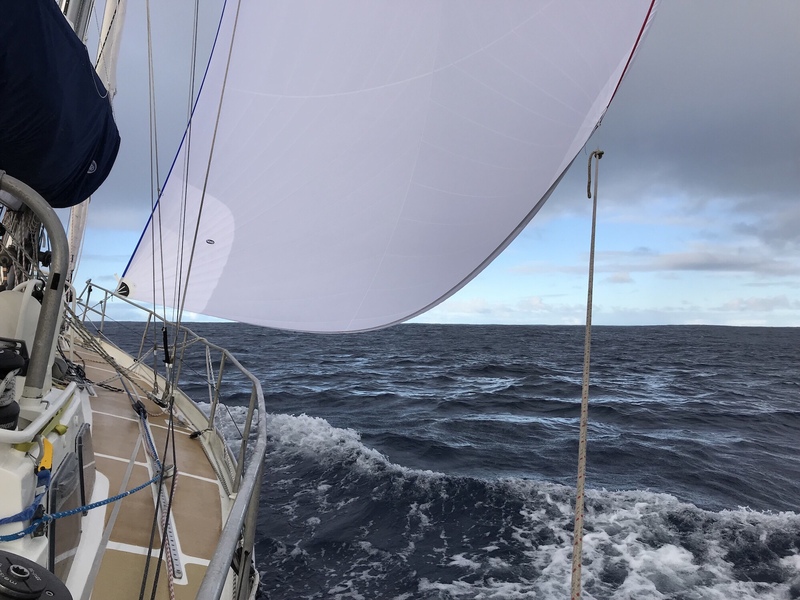 Massive sail. Larger than the two genoas combined. Perfect curvature; pristine white. 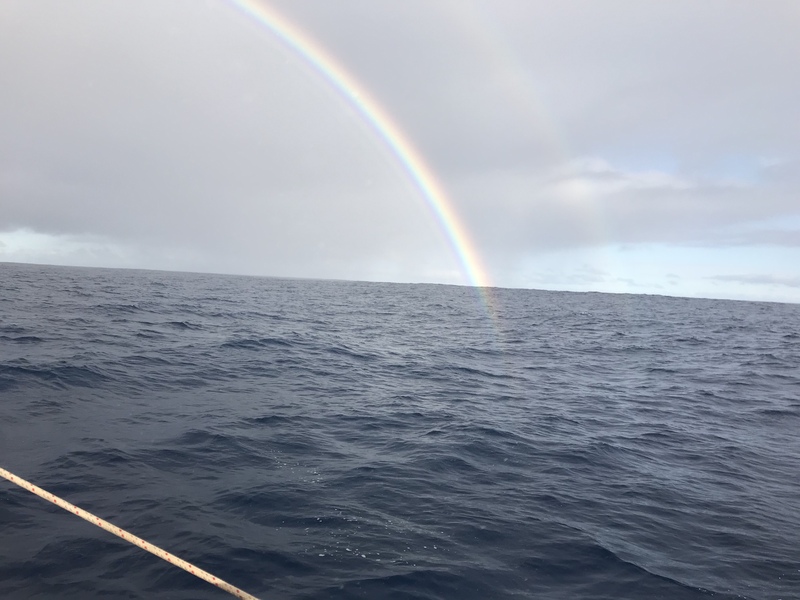 At the front end of the squalls we charged, making 7 and 8 knots in 10 knot of wind. Magic. Interesting photo of a rainbow presented here. 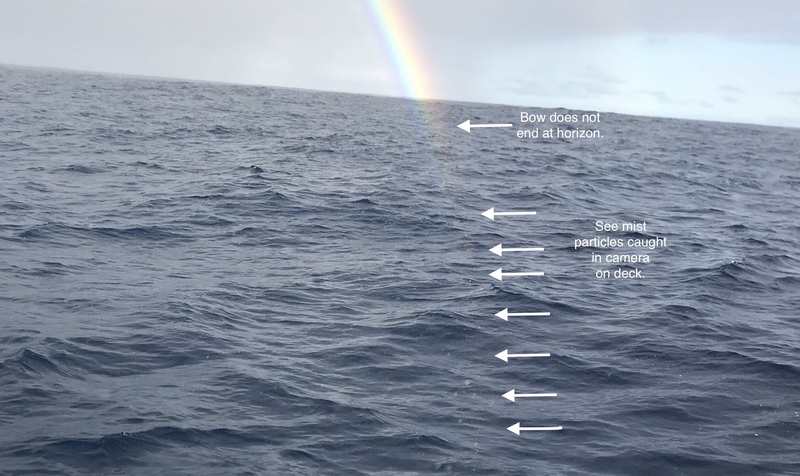 Note that the rainbow does not end at the horizon but extends toward the boat. That’s because Mo is in the mist that is creating the the color display. See that the camera captured mist particles in the close up.